Try serving this recipe with vanilla yogurt! Wash the apples and chop into small pieces. 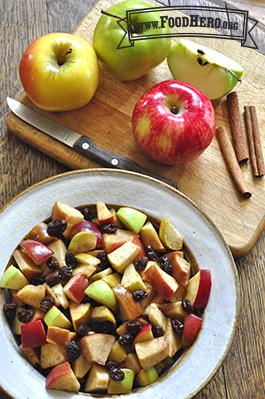 Mix apples with raisins, butter or margarine, sugar and cinnamon. Place the mixture in a baking dish and cover loosely with foil. Bake for about 20 minutes. 8 Comments for "Not Your Everyday Apples"
As Erin mentioned in an earlier comment, this recipe can be pre-made and served cold. Since the Food Hero Overnight Oatmeal is served cold, using the apples as a topping makes for a great mix of two easy to prepare, yummy recipes! This is a great healthy dessert option! Kids really like it! I serve this at schools, and since we have to make it the day before, I serve it cold. The kids love it! I've served it with yogurt and they thought it was like having dessert. Very tasty. Sunflower seeds or nuts can be added for a protein boost. When serving with yogurt, did you pre mix this in with yogurt or serve the yogurt on the side?? When serving with yogurt, I just added a dollop on top of the apples without mixing it in. This is a great dessert (or even breakfast addition) that smells and tastes SO good, my class couldn't believe how little sugar was in it. I will definitely make this one again. Loved it - tastes great, super easy, healthy dessert! This could be done in the microwave also!